Thank you all for indulging me in what I’m tentatively titling “Paris Week” (who am I kidding, EVERY week is Paris week around here). I could have bombarded you with a lot more photos, but I tried to be selective about it. If I overwhelmed (read: bored) you, I apologize. Slash not really, it’s Paris, I think you’ll survive. 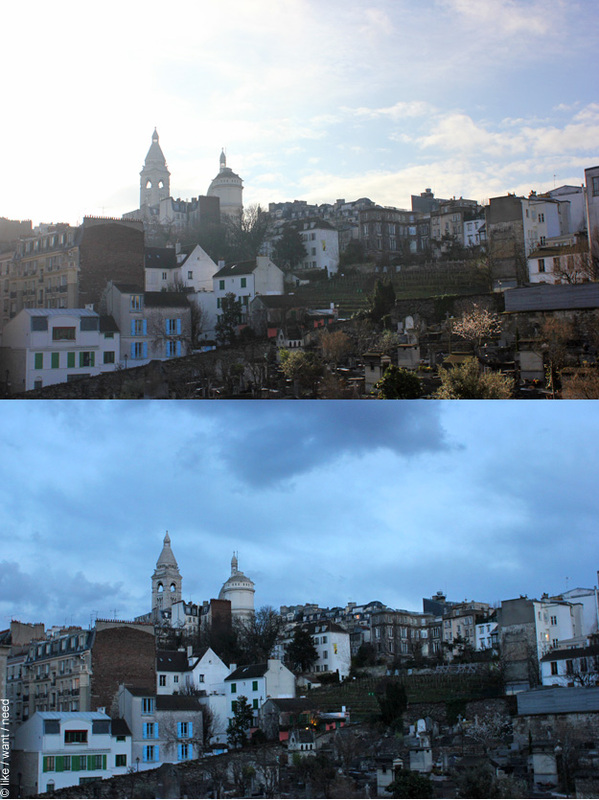 The above is a night and day view from our bedroom window of Sacre-Cœur. And yes, Annie, that’s a tiny private cemetery called Cimetière Saint-Vincent. It’s surprisingly less morbid than you’d think, having a direct view of a cemetery. It was actually really beautiful and there were a bunch of stray cats that roamed it and sunned themselves on the eaves of the grave keeper’s house. I’m so enamored with this city not even a grave yard can deter me. This weekend we’re doing a bit of vintage shopping (fingers crossed I get what I’m after!) and then doing some wedding planning. I think we’re supposed to pick a date or something, I don’t know, people keep asking us. “When’s the wedding? !” “What’s the date for the wedding? !” “Have you picked a date for the wedding yet?” PEOPLE. We’ve been engaged for two weeks today, am I not just allowed to enjoy it? I’ve always though the engagement is an important part of the relationship, not just a year-long crash-course in wedding planning. What do I know, though. I’ve only been engaged for a nano-second. where to start? i think cemeteries can be very beautiful and what a gorgeous resting place. i would love to have that view day and night! and never hold back on photos of Paris! I could look at them everyday, all day long. Bring it on, yo. and ohmygosh, i love that medicine cabinet!!! go gotta go get that thing right now. vintage items are have gotten so expensive here it is pretty ridiculous. i love portland but sometimes we can be a little out of touch on things. people call everything “vintage” – that super ugly could from the 90’s with built in cup holders, yup, it’s labeled as vintage on craigslist here. so annoying. i think it’s perfectly reasonable to enjoy your engagement without wedding planning right away. i mean weddings are lovely and exciting, but it’s a lot of work! so if you feel happy with just being engaged i say who cares what other people want to know. but setting a date might be a fun little weekend activity. . . .so when are you getting married ; ) xoxo!!!! Well. I just love the juxtaposition of night and day time photos. You could have gone on and on posting pictures and telling stories, and I would have kept right on reading. You may not know this, but there are whole blogs devoted just to Paris. Crazy, right? And hey, I’ll totally take one of those cabinets too! Did you know Neel grew up in West Chester? Give it a wave for us! Ahh…wedding planning. It do get absorbing. Enjoy, enjoy. That part of the process can be fun too, you know. Soak it all in. Of course I have horror stories that I don’t want to remember, but that won’t happen to you, I feel sure. Baseball, washing baseball pants, more baseball. That’s my weekend in a nutshell. I’m hoping there’s a bloody mary in there somewhere. WHEN’S THE WEDDING? WHEN’S THE WEDDING? WHEN’S THE WEDDING? I’m not getting any younger! Can you tell which version of the view I like best? The view at night. I like looking at the windows full of light imagining what people are doing, how their living, and creating little stories in my head. Paris week could never be boring! Have a wonderful weekend, Erin! I hope you find that very cool, vintage medicine cabinet this weekend. We’ve got Tball, soccer, and birthday parties. Fun stuff! I can never be bored with Paris – but I suspect that might be only you and me. Don’t worry about picking a date right away! Relish in the whole thing – trust me! You can pick it as soon or as late as you’d like :) Take this time to drown yourself with the Pinterest wedding tab – let yourself absorb it all and find your favorite things!